Dew Gan - RechargeAsia Corporation, Organizer of RechargExpo Thailand 2013. 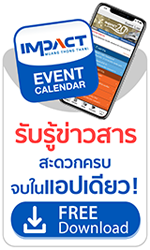 Thai Life Insurance Co Ltd.
“We organise many of our events at IMPACT because the venue is equipped with excellent and modern facilities. IMPACT’s staff truly understands our needs and we are impressed by their personalized services” Thai Life Insurance Co Ltd.